Gold, silver and palladium futures advanced together for a second straight session Monday, while platinum stretched is losing streak to two in a row. In yet another milestone, palladium posted its seventh consecutive record settlement. Gold for February delivery rose $1.80, or 0.1%, to settle at $1,291.30 an ounce on the Comex division of the New York Mercantile Exchange. "The gold trade is continuing to become more fashionable as investors’ appetites grow. Indeed, the climb in geopolitical concerns are behind what is now developing to be a new bull run," MarketWatch quoted Peter Cardillo, chief market economist at Spartan Capital Securities. "We continue to look for higher prices and think a breakout above $1300 is around the corner." 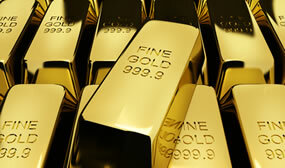 Gold futures ranged from a low of $1,287.70 to a high of $1,296.60. They edged up 0.3% last week. Elsewhere, silver for March delivery added 3 cents, or 0.2%, to close at $15.686 an ounce. Silver futures traded between $15.85 and $15.70. They declined 0.8% last week. April platinum dropped $15.50, or 1.9%, to $802.50 an ounce, ranging from $801.50 to $816.70. Palladium for March delivery added $3.30, or 0.3%, to $1,282 an ounce — another record settlement. Palladium traded between $1,273.30 and $1,297.30. Last week, platinum declined 1.1% but palladium surged 3.6%. Gold rose $3.80, or 0.3%, to $1,292.75 an ounce. Silver declined 6.5 cents, or 0.4%, to $15.615 an ounce. In LBMA prices last week, silver inched down 0.2% while the others gained — 0.7% for gold, 2.8% for platinum, and 4.6% for palladium. United States Mint bullion sales were unchanged as of 4:26 p.m. EST. Below is a sales breakdown of U.S. Mint bullion products with columns listing the number of coins sold during varying periods.